I have ordered from Jay a few times over the last couple of years. It's always been pleasant working with him. Jay is very honest and fair and easy to talk to through e-mail. His fish are of highest quality, always came in with nice colors and good health. If there are some that are slow to color up. . . . This is not your typical Albino Fish. Males show peach red on the upper body and dorsal fin. The lower body is yellow to yellow-orange. Eyes are Red. This is a very attractive fish with exceptional color. Females are yellow-orange. Males sometimes hide color if a yellow lab or a group of yellow labs are in the same tank. Single Males will mix with Peacocks and haps. Last, Grow Out Count 03/07/2018 Next Count due 03/29/2019. 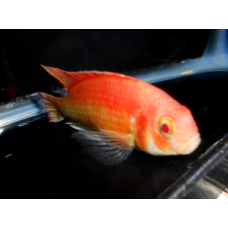 This fish is being discontinued from stock and is on clearance price sale. Once they are gone from stock, they will only be available through a special order list. Rare, very Colorful fish that is compatible with many other African Cichlids. These fish are grown out from in-house breeders and added to in orders from my wholesaler. Do not overlook this fish. Males can provide excellent color in an all-male color tank. Maximum Size Males 4.5" Females 3-3.5"